From the first chapter of Genesis through the Old Testament, and trickling into the New Testament, cattle and milk are mentioned literally and figuratively by God and his prophets to demonstrate gospel principles to His people. In additional to being used as a reference point to those living in biblical times, and as a teaching tool through dream and allegory, cattle and milk are referenced to emphasize the cultural importance of cattle and milk to God’s people. Genesis 1:25 “And God said, Let the earth bring forth the living creature after his kind, cattle, and creeping thing, and beast of the earth after his kind: and is was so.” And we see that on the sixth day the only two creations mentioned specifically by name are cattle and man, and so begins the grouping of the relationship that exists between to the two. From the creation we advance to the understanding cattle and man exist together with the relationships denoting wealth and power as noted in Genesis 13:2, where among Abrams riches we read, are cattle, gold, and silver. In Genesis 18 as Abraham entertains three holy at the plains of Mamre, he hastens Sarah to “make ready a fine meal”. Before the three men was set a dressed calf, butter, and milk. At the conclusion of this meal, Abraham and Sarah are told that Sarah would have a son. Despite Sarah’s doubt, she receives the question, “Is anything too hard for the Lord?” Shortly after they are blessed as she brings for Isaac. Maybe one of the most popular and well known stories in the bible that mentions cattle is in Genesis 41 when we read the story of Joseph and his coat of many colors. After being sold into Egyptian slavery and thrown into prison by the false accusations made by Potiphar’s wife, Joseph then interprets the pharaohs dream (Gen 41). While the Pharaoh’s dream show seven thin and ill-favored cattle swallowing up seven healthy grazing cattle, there is no mention of milk. I would suggest that while we could easily project cattle owners reaped the benefits of owning cattle, in the way of dairy products and meat, this story shows how God uses an image of cattle to teach his children, bless Joseph for his righteousness, and to bring about Joseph’s deliverance from prisoner to righteous leader of Egypt. Joseph’s successful interpretation of the dream paves the way to fulfill the inspired message that Joseph received while a young man, that he would rule over his brothers. At the burning bush, Moses is told of the good land described as, “the land of milk and honey”, to which God will deliver the children of Israel. (Exodus 3:8) The children of Israel again give thanks for the same land after arriving years later. In this chapter, they covenant to keep the commandments and God promises to make them a holy people and a great nation (Deut 26:9). From the creation of the earth up until modern day we see the hand of god in the existence and sustenance of his children both figuratively and literally. While the bible shows a relationship between man and cattle and importance that cattle held throughout ancient times, it seems to place an emphasis as cattle as a commodity and a provider for man’s use. For somebody not familiar with cows, it would be easy to look at the relationship between man and cattle and to think that it is a 2 part contract. I supply the feed and shelter and you provide the milk and meat. When I imagine a “land of milk and honey”, I imagine the kind of place that sustains cattle and bees, not the foods they produce. A place with abundant pastures, rivers, and shade. A place where man would prosper and would want to be, and in that place cattle would also be. If you ask a dairy cow owner how many participants exist in the relationship between man and cattle I could easily tell you the answer is three. There is no contract here but a covenant as divinely present now as it was in the beginning. There have been many quiet mornings for me on our small farm. Mornings that are cool and quiet. Mornings when I sit on a milking stool while flies sit cold and motionless on the walls around me and in those moments there is a peace and an interdependence between heaven, animal, and man that is not supplied by the world. Those moments of quiet reflection bring answers to my mind, and calm my problems, in those moments I understand why God gave cattle to man. The Lord’s overwhelmingly bountiful blessings are transparently and wonderfully seen again and again in the Bible’s words on milk. We serve a God whose goodness towards us surpasses our expectations and whose blessings towards us fill up our cup to overflowing (Psalm 23:5). Throughout the whole scriptures we find examples of the milk used as a metaphor for the most basic, essential aspects of our faith in God and His love, and also as a metaphor for these overwhelming blessings we receive as a result of God’s love for us. Again and again throughout the Old Testament, the Israelites are promised the blessing of a land flowing with milk and honey (Exodus 3:8, 17; Numbers 13:27; Joel 3:18; Ezekiel 20:6). Obviously, no one expected the promised land to actually have streams of milk or rivers of honey. Yet anyone who has ever kept animals (or bees, for that matter) knows that it is not effortless or even predictable. For the lambing, for the harvest, for the milking, God’s hand is evident in the miracles of life, the miracle of turning grass into milk, the miracle of turning pollen into honey. The farm is full of daily miracles, and God’s blessing alone determines the ease of the labor and more importantly, its success. When God promises a land flowing with milk and honey, it is a promise for blessing through our labor, it is a promise for fruitfulness in what we touch. Just as the Old Testament uses milk as a metaphor for God’s delight in showering us with more blessings than we can even use, the New Testament calls the building blocks of our faith the milk of the word and the greatest blessing. 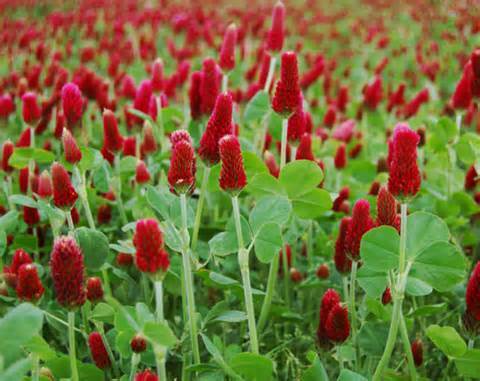 God’s blessings are consistently a story of sweet abundance and a land which yields its fruit (Lev 26:415). A number of times throughout the New Testament (I Peter 2:2, Hebrews 5:12-13, I Corinthians 3:2), writers tell their audience that they are being fed on the milk and are not yet ready for the meat. I was reading through some of these verses with my son and asked him what he thought milk meant in these verses. He thought about it for a minute and then answered that the milk was the gospel. I agree with him — as new Christians, either because we are young in age or just young in Christ — we absolutely need the most basic food of the gospel of Christ’s death and resurection. It is this that helps draw the conclusion that in no way to the apostles mean to imply that milk is no longer a food for the mature; meat of the gospel, more complex and deeper understanding of our life in Christ, is a completely necessary part of our growth and sanctification. However, no matter how much we grow in our faith we can never abandon the root of the gospel, the sweet milk of those first truths. God’s greatest, most overwhelming blessing is the gift of His Son. The culmination of abundance is salvation through Christ’s sacrifice. The reflection of Him is in the constant, daily abundance God provides for us in all our lives. Animals that willingly yield milk to their keepers are a beautiful picture of these blessings. With proper care, they take the fresh water and grass and grain they are given, and by God’s grace yield forth milk that fills jars, fills buckets, fills glasses, and fills the mouths of calves and children. Like the river of life in Ezekiel which grows and grows, the Bible likens milk to a blessing that pours and flows throughout the land. 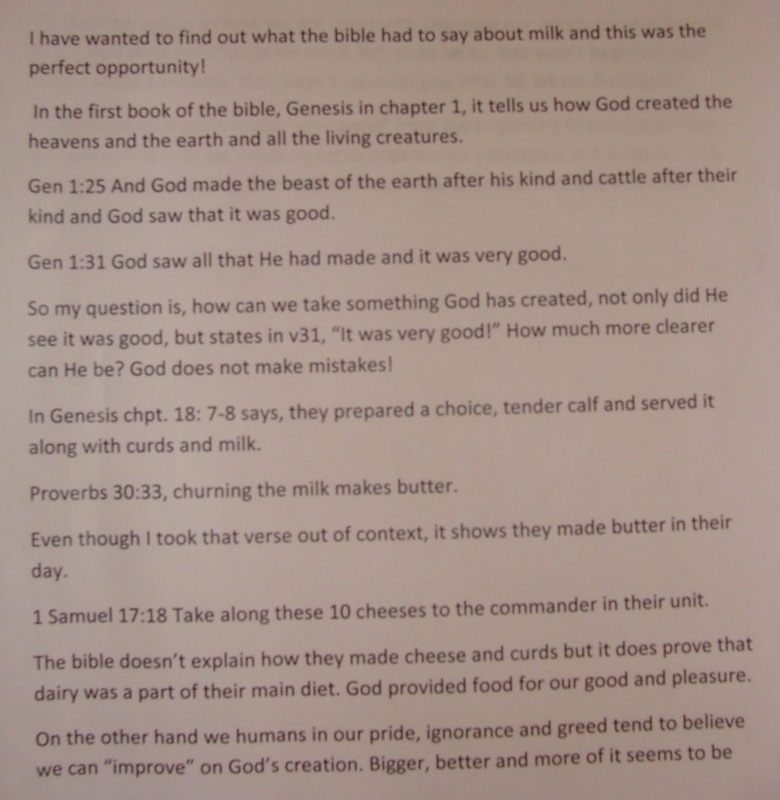 Milk in the Bible By Shawna R.
Milk in the Bible, what does it tell us? We all know that with little milk you savor each drop, and with a lot – you are a sudden cheesemaker and friend to anyone you know. This line in the bible, read as it is really can summarize the blessing of milk stock in our life. The milk we drink from the cow not only can nourish our bodies but heal the soul with each delightful drink. This passage starts as a man takes under his care two sheep and a calf. As we look more in depth at the scripture above, we search for Gods message. God gave us this life to be stewards of this creation we call earth. We are here to protect one another, the land and each living creature. Just as God takes care of us, we take care of him by living as he created us. A simple act of caring for a small calf, to reach out to a living being with intention to ensure she is safe and healthy revealed Gods endless gifts in return. Her milk is a miracle, a true gift from God as it not only feeds us but allows us to then provide for others and aid in the additional production of food. This small calf was nurtured as God does for us, to grow strong and to provide for those around her so they too can flourish. It’s simply one of God’s most perfect lessons one could take from the bible. This sermon was written for the parishioners of a small farming community, its objective is to acknowledge and support the historical and present day importance of their work and to encourage them to consider the biblical connection between milk and their faith. Good morning my dear children of God. This morning I will speak about milk- yes, milk – milk in the bible. 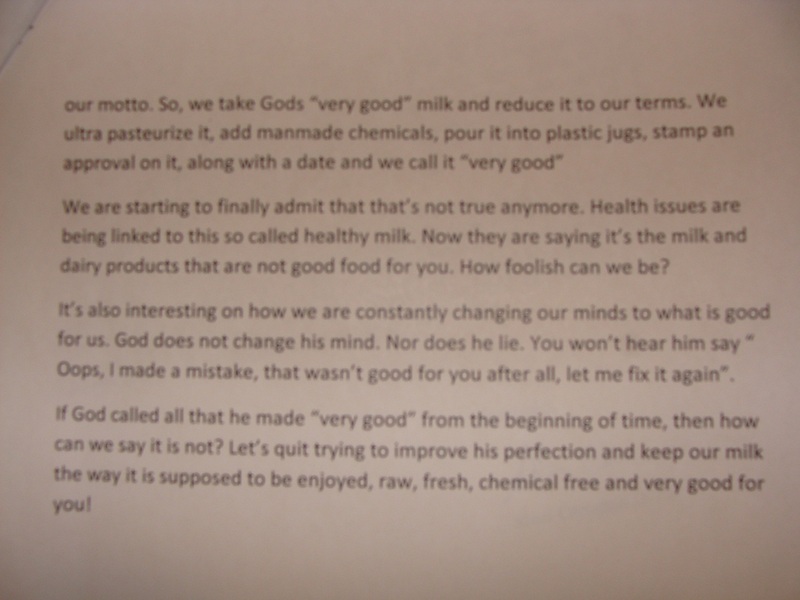 So…what does the bible say about milk? Plenty. Just to mention three examples. Here the Lord uses milk along with honey, in a symbolic way to make a point about goodness and fullness. Cows will only produce abundant rich milk when raised in fertile pastures. Literally, the citation refers to the promised land, Israel. More broadly one could say that the land of milk and honey is eternal life or heaven. In this verse “milk” a rich and nourishing food is effectively used to symbolize goodness and heaven, abundance and prosperity. Man has consumed dairy products for thousands of years. As early as in biblical days when there was no refrigeration milk was also used to make butter and cheese thus providing many valuable and essential nutrients. Throughout the bible milk is used symbolically. As milk was a very important part of man’s diet it is very appropriate that it was used in that way. Examples from the New Testament also emphasize the importance of milk. To me it seems that in this case the Lord may be drawing an analogy between babies who are not able to eat and digest solid food and man’s mental and spiritual capacity to understand the mysteries of faith. On one hand the fact that babies cannot eat solid food is easily understood. On the other hand mature man may believe but not fully understand the mystery of God’s existence, creation, life after death and other mysteries of faith. In this verse “milk” was very effectively used to make a point about the basics of faith. Everyone knows the vital importance of milk to the survival and growth of an infant. A newborn is immediately placed on its mother’s breast to receive nourishment but also to establish an important bond with the mother. So believers are strengthened by continuously receiving the spiritual milk in the form of the word of God. It is the very sustenance needed for their faith to grow , flourish and maintain a bond with the Lord. As you leave this morning think about milk and its importance in your lives and that of your neighbors as it relates to your faith. As you read your bibles be aware of the milk references and consider how they may relate to your faith. Go in peace to know and serve the Lord. The Bible is so full of life-giving words; how we love it, and seek its pages for wisdom. When I saw this was One of the selections in the contest for Birdie, I decided to see what the Bible had to say about milk. It ended up there was so much I found, that only the “tip of the iceberg” can be touched! Colostrum itself is full of “jumpstart” properties that a newborn must have to thrive. Milk contains antibodies that protect the baby, human or animal, from germs, & sicknesses it may be exposed to. A baby needs nothing more in it’s diet; it contains vitamins, nutrients, energy, etc. In His great wisdom, God created this life-giving substance, MILK, and there’s not one of us that cannot relate to the necessity for it. ( Is.55:1)! And MILK would be in abundance for their household, and maidens (Prov.27:27). It was used as an EXHORTATION in (1Cor.3:2, & Heb. 5:13) That we would move on from the “baby” food of milk-in the word of God, to the “meatier” applications & lessons in it. True, no adult in his physical life continues to live on milk alone. Lastly, I found it to be an ILLUSTRATION… The beautiful picture of new born babies desiring the sincere MILK of the Word, that we may grow thereby (1Peter 2:2). It is amazing to watch the eagerness of a baby as it craves & drinks milk, never getting tired of the same meal every day. And what a loving Heavenly Father, who delights to feed His little children milk! Adult entry – by Joseph C.
Milk is the primary source of nutrition for young mammals before they are able to digest other types of food. As in the Bible 1 Peter 2:2 “As newborn babes, desire the sincere milk of the word, that ye may grow thereby.” We find that as our physical bodies require a beginning nutrient for latter consumption ofstronger, harder more flavorful foods, God has in his word the same parable of picture for us. That in our beginning walk as baby Christians we are to take in the nutrients that will fortify and establish the properbuilding blocks for physical strength and endurance. Life is an endurance test, full of ups and downs, bitter and sweet, hard and soft times. It all began with the nutritious milk from our mother. As life went on so did our growth from this buildingblock substance. As we read the Bible, in the beginning God created the Heavens and the Earth, we begin to have faith, joy, love, temperance, meekness and longsuffering. As milk put into our bodies the essentials for eating regular food, we find that in the Bible we gain and continue to gain what was needed to endure life. Today as adults we need the Word to sustain us we still have needs from milk too, continuing to enrich our lives in every way. Jesus Christ is truly our milk to build our lives. Where is the land of milk and honey? In north India there is a pilgrimage town called Sitapur, where we find, among 30,000 other holy spots, the Sacred Heart monastery. This story is of a monk there who asked himself the question, “Where is the land of milk and honey, according to native tradition?” We will call him Father David. Driven by his query David was one day searching the Hindu section of the monastic library when his eyes fell on a book cover bearing the title Bhagavat. He remembered from his religious studies that it was actually written in this area, but long ago when there was just jungle. David brought the book with him after dusting it off and went for a walk, a field trip to the spot where the author of Bhagavat, Vyasa, used to live. Reaching the place, he was relieved to find that he was alone and could sit down for contemplation. After a few moments he opened the book, and with that, his surroundings transformed in a pulse. After Suta had spoken the jungle again transformed, and David woke up. Finding himself alone on the ground in modern day Sitapur, he saw the Bhagavat laying next to him, well read. He picked up his crucifix and touched it to his forehead. With a relaxed firmness of heart he arose and headed back towards the monastery, enriched in his faith by his blessed experience.